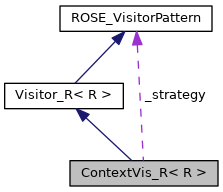 Strategy pattern applied to visitors: serves as a context to a strategy, which itself is a visitor; delegates all requests to the current strategy; capable of switching strategy at will. Derived classes may declare the known strategies as friend to facilitate communication between the strategies and their context. Definition at line 477444 of file Cxx_Grammar.h. Strategy to process a node, can be set dynamically. Result of a visit method. Allows the strategy to be set dynamically. strategy a visitor to process a node. Definition at line 477454 of file Cxx_Grammar.h.